A lively exhibition of large-scale paintings by renowned Christchurch-based artist Philip Trusttum. 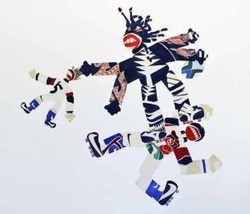 Assembled as giant collages in the Gallery, the works explore our national game. For a link to Sarjeant Gallery's website please click on image. These large scale and energetic multi-part paintings depict rugby as never seen before. Come along to hear Philip discuss these works in conversation with Greg Donson and Bill Milbank, former Sarjeant Gallery director and long-time supporter of the artists work. For a link to the Facebook "Event" please click on image. Serious About The Game: Bill Milbank looks at Philip Trusttum’s recent paintings, which deconstruct the physics, personalities and cultural dynamics of New Zealand’s most popular sport. For a link to the Art News New Zealand website please click on the image. To celebrate the Rugby World Cup, the TSB Bank Wallace Arts Centre is featuring rugby inspired works from the Wallace Arts Trust Collection including works by artists Philip Trusttum, Mark Braunias, Jacqueline Fahey, Kate Walker, Michael Shannon and Stuart Page. Highlights include six works by Philip Trusttum: an early piece from 1997 using oil on hardboard, and five of his distinctive large cut-out canvas works created between 2010 - 2011 that can be re-assembled in varying ways to reflect the dynamic action of the players and the game. Trusttum has always painted subjects from his immediate life. His father was an All Black trialist and played for King Country, while Philip played for North Canterbury in the 1960s. While he gave the game away, the creative possibilities within the constructs of rugby, as well as the culture of the game itself have made the subject as relevant now, as it was then to Trusttum and his concerns. For a link to the TSB Bank Wallace Arts Centre Website please click on the image. Join the Wallace Arts Trust in celebrating the opening of the 'Philip Trusttum Survey' Exhibition and Book Launch on Monday 17 October at 6pm.The opening event will also feature a Q & A session with Philip Trusttum, hosted by Dr Robin Woodward, an art historian from Auckland University, and the principal author of the book. Philip Trusttum is without doubt one of New Zealand’s most important living artists. The Wallace Arts Trust has the most substantial holdings of Philip Trusttum’s works, numbering 222 works covering a span of over 50 years; resulting in an artist’s diary without comparison. The Trust is proud to host the first complete survey of his oeuvre and launch a book dedicated to his practice. Painter Philip Trusttum deconstructs the game of rugby, using his long-established cut-out technique to explore the complex cultural dynamics and physical theatre of New Zealand's most popular game. For a link to Whitespace's website please click on the image. With a career spanning 35 years and work represented in many major international and New Zealand collections, this is an exhibition of Richard Parker's signature ornamental vases. The exhibition surveys the career and practice of this defining figure within New Zealand ceramics, with works loaned from leading public and private collections around the country. 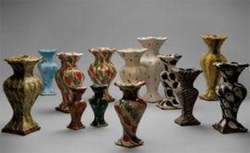 The curator, Richard Fahey (Objectspace) said Parker had his own picture of what a pot should look like", and that although Parker's practice is grounded within the traditions of studio ceramics, "as an artist, his innovative approach seeks to redefine for us new ways we may understand the decorative object." At a pivotal moment in his career Richard Parker abandoned the known in terms of how to make a pot and what it should look like and developed his own unique ceramics vocabulary. This singular vision has sustained his career for over 30 years and produced works that are uniquely recognisable. For a link to Whangarei Art Museum's website please click on image.